These tree peonies bloom beautifully for years. Yesterday I noticed my tree peony has started to bloom already — in fact, it went from just slightly open to fully in bloom in a few hours Saturday afternoon. My other peonies — all the herbaceous type — have a few tight balls on them, but no sign of bloom. I bought this one (sorry, I don’t have a record of its name) a few years ago at the very end of the peony season (fall), planted it in the cold and hoped for the best. It made it through its first winter and seems to like the moderately sunny spot where it is planted. 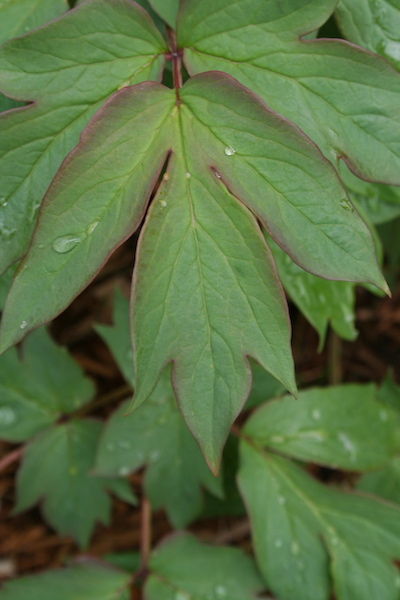 Tree peonies have lovely foliage that is part of the joy of growing the plant. Unlike herbaceous peonies, tree peonies develop a trunk-like stem and do not die to the ground each winter. They bloom on old wood and can get as tall as 5 feet. They also have a more striking foliage than herbaceous peonies. Each of the leaves is edged in purple. While my plant has been in the ground two (or maybe three) years, it is still dainty. Most experts recommend some winter protection for tree peonies this far north (oops, I better do that this fall!) but otherwise they are not difficult to grow. (Update from 2018: I never covered my tree peony and it got better and better each year. Go figure.) They need four to six hours of sunlight and a moderate amount of fertilizer. It takes them five or more years to reach full size. That’s OK, though, because like other peonies they are long-lived. Most peonies will out-live the person who plants them by several decades. I am looking for some additional plants for my perennial bed and am wondering if you think this would be a good one. The bed is divided in two parts and I have perennials around the edges, but need to fill in some middle space. Would this be very tall? Or, do you have any other ideas for a perennial bed that is sometimes neglected….I try, but am a novice gardener and sometimes by July, I am a little slow to fertilize/water/deadhead…you get the picture. So, I need something that can handle sun all day and TLC about 70 percent of the time. Peonies would be nice in the middle of the bed. They bloom once a year — in May/early June. The foliage remains throughout the summer and would provide a green background for your other perennials. The herbaceous peonies get about two or three feet high. Another option for sun might be roses — the Knockout roses are very easy care — or if you want late summer bloom, asters are a great option. 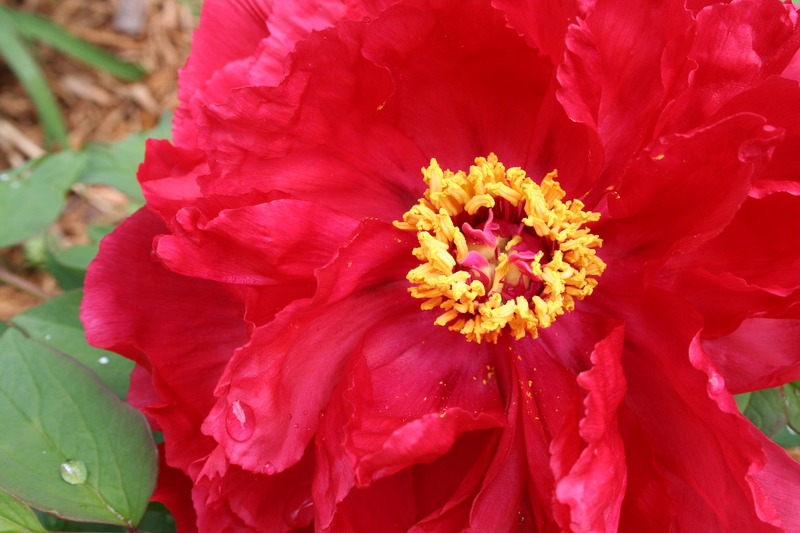 In response to Elly – Peonies make excellent perennial bed plants. Lots of colors to choose from and they are low maintenance and easy. In my Raleigh, NC yard, my peony foliage begins to look a little rough by the end of August but that is due to our frequent droughts and high heat. Regular watering or a cooler climate would keep them looking fresh for longer. The weather does NOT affect the next year’s blooms though so I usually leave my peonies alone.